From an early age I have tried to instill in my kids that they are fortunate to have what they have. Do they have everything that they want? NO! I don’t want them to have everything that they want. Needing and wanting are two different things. They need clothes, food, water, shelter, etc. Everything else is just stuff. In my opinion, if they really want something they need to earn it. Every couple of months I go through clothes, shoes, their toys and books and have always included them in this process. If we are donating to Am Vets, Purple Heart or a friend who is struggling, I include them and explain the reasoning behind the action. Last year around this time, my family helped to prepare food for a homeless shelter and the kids were there to help. 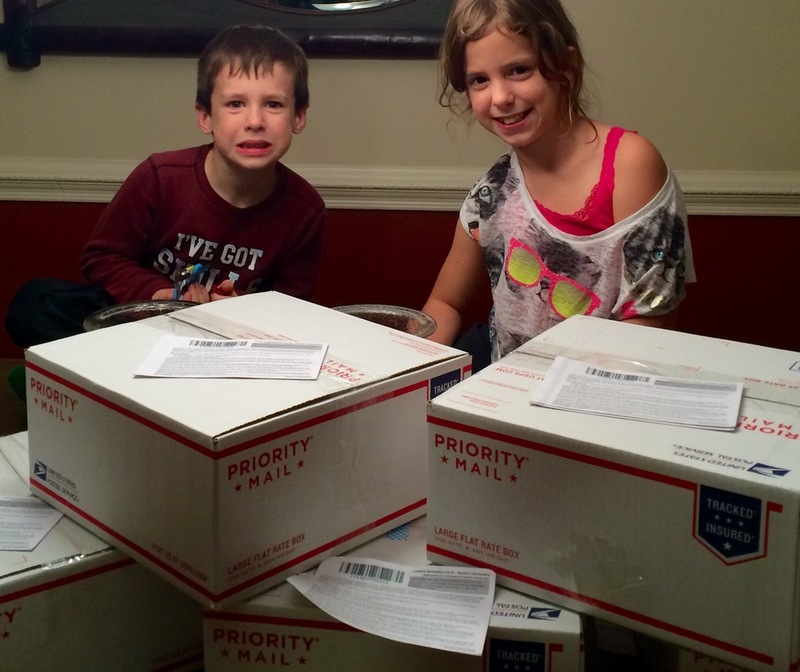 This year I heard about “Treats 4 Our Troops” – www.treats4ourtroops.org, an organization that sends care packages to the troops overseas and works with Walter Reed National Military Medical Center and Ft. Belvoir to deliver soldiers treats. 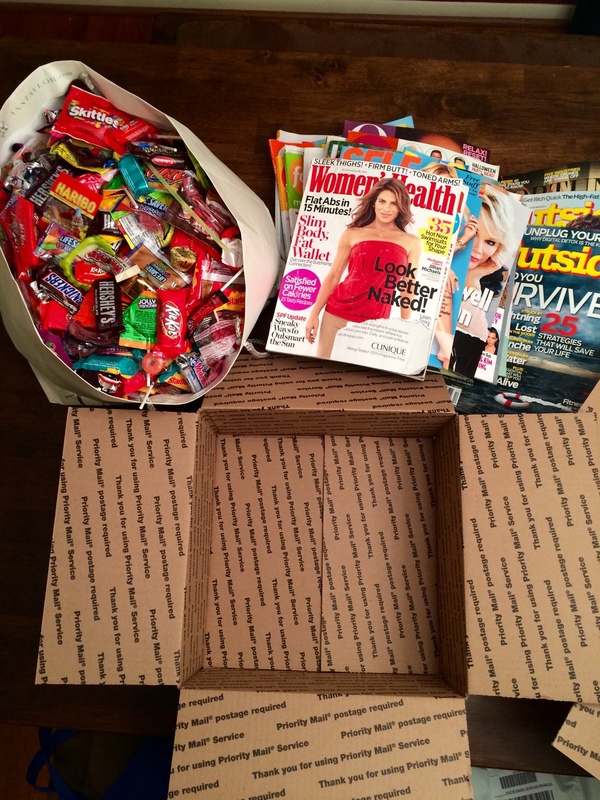 The treats include holiday candy and current magazines. The kids and I decided to put a smile on the soldiers’ faces and deliver some goodies. To start the collection of candy and magazines, I posted information on Facebook and started talking to friends. Everyone was more than willing to add to the donation -- I have amazing friends! We ended up with 50+ magazines and 60 pounds of candy! The kids were amazed how many people chipped in and helped us, but had a hard time grasping why the soldiers did not have access to what we were sending them. I reminded them that the soldiers receiving the packages had been out of the country for months. The soldiers that the boxes were going to had been away from their families and friends and what we were doing would bring a big smile to their faces. Most boxes had a homemade note or letter that our men and women could read. We get so wrapped up in our lives that we forget about the sacrifices made by others; I know I do at times. My plan is to do this every year and I'm in hopes that next year we can collect more, ultimately putting even more smiles on our troops faces’. To continue to teach my kids about giving back we will be adopting a child for the Holidays through the Salvation Army. If you are interested in helping out our soldiers, their families or families that are less fortunate there are a lot of choices out there. Give back, help a family out and put a smile on their face. You don’t have to spend a lot of money to warm a person’s heart.